A newly published study by researchers at the University of Massachusetts and the University of California, Davis sheds new light on the mechanisms involved in obesity-enhanced colon cancer and may offer a therapeutic target to block and treat colonic inflammation. The research, published April 30 in the Proceedings of the National Academy of Sciences, indicates that inhibiting an enzyme, soluble epoxide hydrolase--discovered in the Bruce Hammock lab at UC Davis--may reduce the risk of obesity-related inflammation of the colon. Co-first authors Weicang Wang and Jianan Zhang of the Guodong Zhang lab, Department of Food Science, University of Massachusetts (UMass) and Jun Yang of the Hammock lab and the UC Davis Comprehensive Cancer Center, noted that 30 percent of Americans are obese, and these individuals have a 30 to 60 percent higher risk of developing colon cancer. It is the third most common cancer and the second leading cause of cancer-related deaths in the United States. Colon inflammation is an early symptom of cancer. “But to date, the mechanisms by which obesity increases cancer risks are not well understood, and there are few effective strategies to prevent obesity-enhanced colon cancer, said co-author Guodong Zhang, a former postdoctoral researcher in the Hammock lab and now an assistant professor of food science at UMass where he focuses his research on prevention of colonic inflammation (inflammatory bowel disease) and colon cancer. In the study, the 18-member team, including five UC Davis researchers, investigated the roles of sEH in obesity-induced colonic inflammation, which included using two different sEH inhibitors and a knockout mouse genetically modified not to produce sEH. Results proved similar in all cases. They further conducted another study in both lean and obese mice with experimentally induced colon inflammation and used molecular analyses to follow a pathway called Wnt. About 90 percent of sporadic colorectal cancers have activating mutations within the Wnt pathway. The team found that obesity increases activation of Wnt signaling in the colon, but it can be abolished by the two different inhibitors and the knockout. Co-authors Jun Yang, Debin Wan, Jia Sun of the Hammock lab, as well as Jun-Yan Liu of China, a former postdoctoral researcher in the Hammock lab, did the analytical chemistry, and co-author Sung Hee Hwang of the Hammock lab did the organic chemistry, making the compounds that were used.Jun-Yan Liu is already collecting human samples to test the hypothesis in man, Hammock revealed. The soluble epoxide hydrolase inhibitors that block production of these diols will soon enter human clinical trials supported by the NIH-NINDS Blueprint Program (National Institutes of Health's National Institute of Neurological Disorders and Stroke). “These drugs could provide relief for patients with a wide variety of inflammatory bowel diseases and possibly reduce obesity driven colon cancer,” Hammock said. 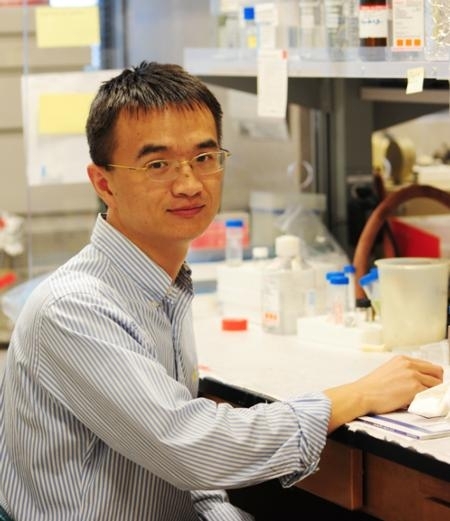 The team hailed this as a promising treatment in humans, but acknowledged that “mice and humans are very different.” However, Jun-Yan Liu is already collecting human samples to extend the study, and Hammock pointed out that they hope that the soluble epoxide hydrolase inhibitor will be in human clinical trials this year. The five UC Davis researchers—Bruce Hammock, Jun Yang, Jia Sun, and Sung Hee Hwang and Debin Wan—are all with the Hammock lab and the UC Davis Comprehensive Cancer Center. 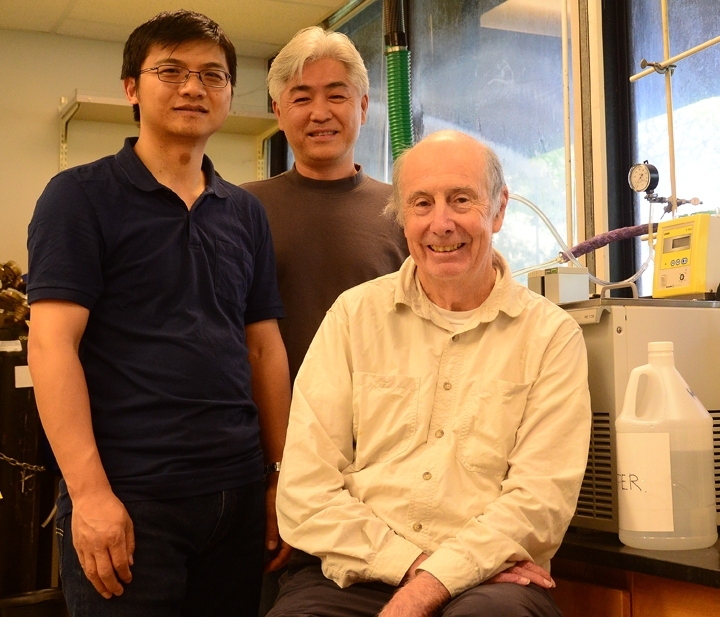 Other UMass researchers were Yuxin Wang, Wiepeng Qi, Haixia Yang, and Professor Yeonhwa Park, Department of Food Science, Katherine. Sanidad, Food Science and Molecular and Cellular Biology Graduate Program, and Professor Daeyoung Kim ofthe Department of Mathematics and Statistics. This work, titled “Lipidomic Profiling Reveals Soluble Epoxide Hydrolase as a Therapeutic Target of Obesity-Induced Colonic Inflammation,” drew grant support from the USDA's National Institute for Food and Agriculture; National Institutes of Health's National Institute of Environmental HealthSciences (NIH/NIEHS); NIEHS Superfund Research Program, and the National Natural Science Foundation of China. Hammock, a member of the National Academy of Sciences and the National Academy of Inventors, directs two major UC Davis programs; the Superfund Program financed by the National Institute of Environmental Health's National Institute of Environmental Health Sciences (NIH-NIEHS); and the NIH Biotechnology Training Program. The Hammock laboratory has published almost 900 peer-reviewed papers on the sEH enzyme, discovered while Hammock and Sarjeet Gill (now of UC Riverside) were researching insect developmental biology and green insecticides at UC Berkeley. The work, begun in 1969, led to the discovery that many regulatory molecules are controlled as much by degradation as by biosynthesis, Hammock said. These epoxy fatty acid chemical mediators control blood pressure, fibrosis, immunity, tissue growth, and pain and inflammation. For many years Gill and Hammock were alone in studying this enzyme but today its importance is well recognized in mammalian biology, with more than 17,000 peer-reviewed papers in the area. Hammock credits the NIEHS for supporting research in this area since the 1970s. A Davis-based company, EicOsis, has received a large grant from the U.S. National Institutes of Health to move inhibitors to the clinic to treat diabetic neuropathic pain. “We are developing a non opiate analgesic to treat the chronic pain often associated with diabetes and hope to be in human trials over the next 12 months,” said William Schmidt, vice president of clinical development at EicOsis.